Messier 69 (M69) is a globular star cluster located in the southern constellation Sagittarius. Messier 69 lies at a distance of 29,700 light years from Earth and has an apparent magnitude of 8.31. It is one of the fainter globulars listed in Messier’s catalogue. Its designation in the New General Catalogue is NGC 6637. The cluster is visible in small binoculars, but not easy to observe from northern locations because it never rises high above the southern horizon. In 10×50 binoculars, M69 appears as a fuzzy star, while small telescopes will show a comet-like shape. Individual stars in the cluster can be resolved in 8-inch and larger telescopes. The best time of year to observe M69 is during the summer. 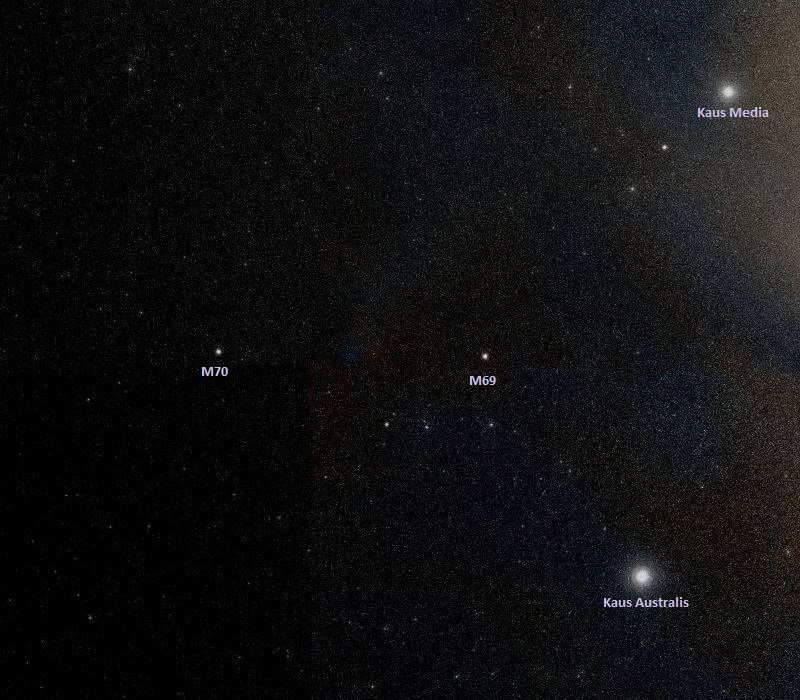 Messier 69 is easy to find as it lies inside the Teapot asterism in Sagittarius, about 1-2 degrees north of the imaginary line connecting the two bright stars at the base of the Teapot: Ascella, Zeta Sagittarii, and Kaus Australis, Epsilon Sagittarii. 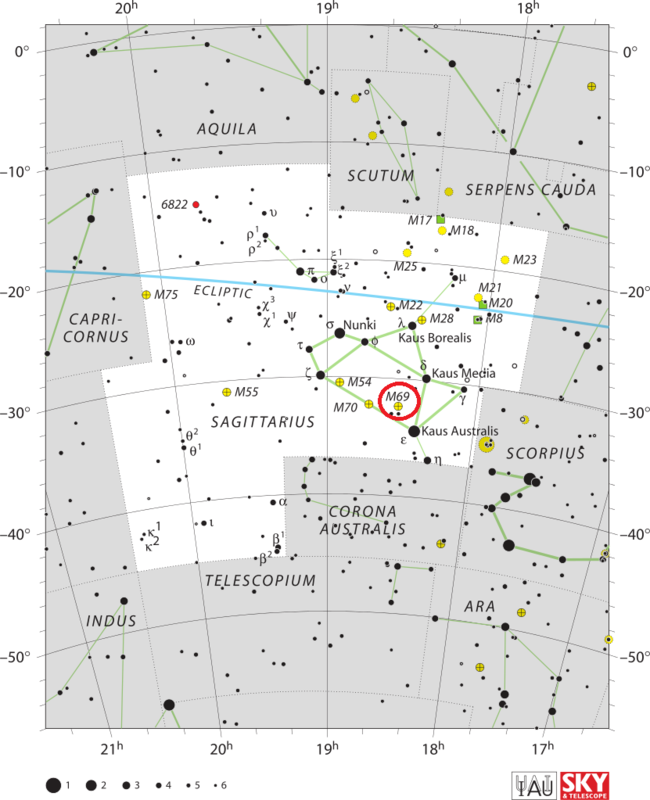 The cluster is located at about a third of the distance from Epsilon to Zeta, 1.5 degrees from Epsilon Sagittarii. 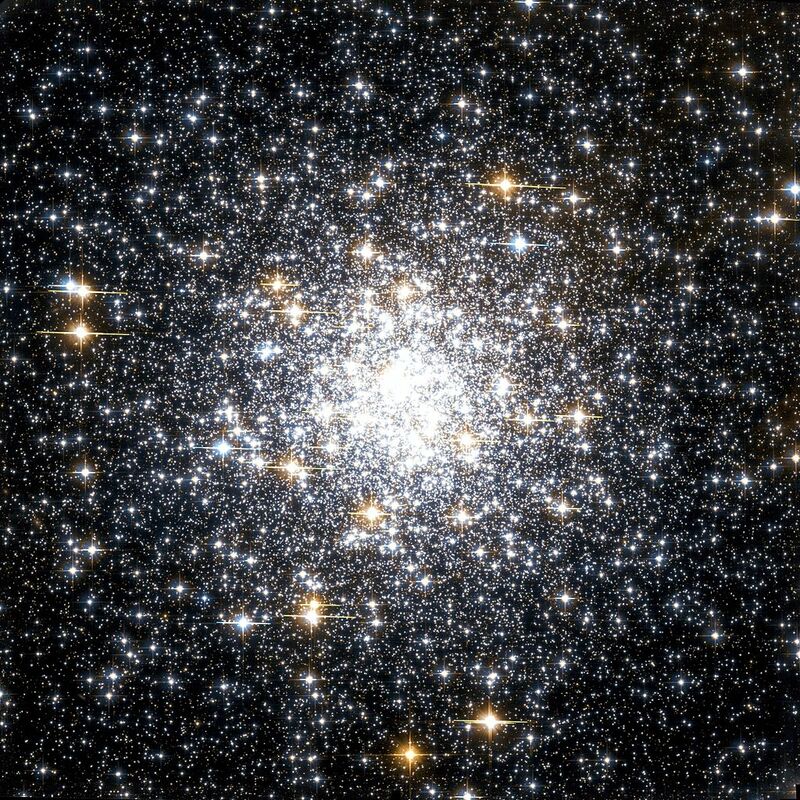 This dazzling image shows the globular cluster Messier 69, or M69 for short, as viewed through the NASA/ESA Hubble Space Telescope. 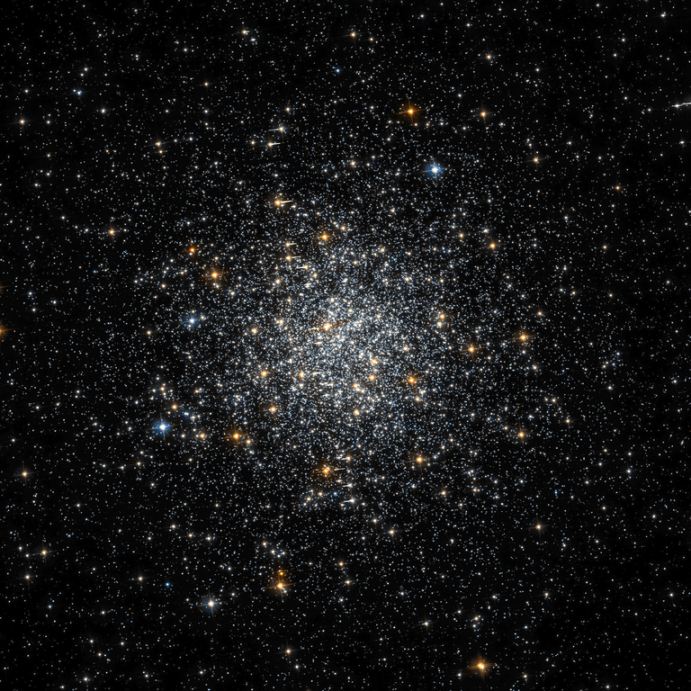 Globular clusters are dense collections of old stars. In this picture, foreground stars look big and golden when set against the backdrop of the thousands of white, silvery stars that make up M69. Another aspect of M 69 lends itself to the bejewelled metaphor: As globular clusters go, M69 is one of the most metal-rich on record. In astronomy, the term “metal” has a specialised meaning: it refers to any element heavier than the two most common elements in our Universe, hydrogen and helium. The nuclear fusion that powers stars created all of the metallic elements in nature, from the calcium in our bones to the carbon in diamonds. Successive generations of stars have built up the metallic abundances we see today. 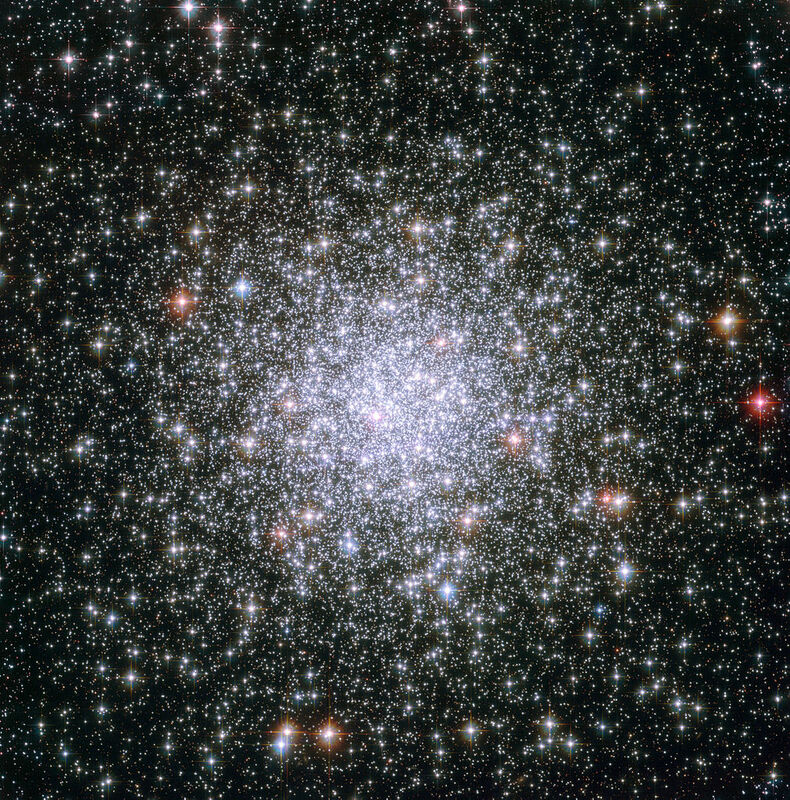 Because the stars in globular clusters are ancient, their metallic abundances are much lower than more recently formed stars, such as the Sun. Studying the makeup of stars in globular clusters like M69 has helped astronomers trace back the evolution of the cosmos. M69 is located 29 700 light-years away in the constellation Sagittarius (the Archer). The famed French comet hunter Charles Messier added M69 to his catalogue in 1780. It is also known as NGC 6637. Messier 69 occupies an area of 9.8 arc minutes, which corresponds to a linear radius of 42 light years. It lies only 1,800 light years from its physical neighbour, the globular cluster Messier 70, which is located at similar distance, about 29,400 light years from Earth. Both clusters lie close to the centre of the Milky Way. M69 is only about 6,200 light years from the galactic centre. Of the three Messier globulars found inside the Teapot (M54, M69 and M70), M69 is the brightest. With a density classification of V, M69 has an average concentration of stars. The cluster’s core is about 0.68 arc minutes in diameter, which corresponds to a linear extension of about 6 light years. M69 has a mass of about 300,000 solar masses. The half-mass radius of M69 is 0.83 arc minutes, or 7.2 light years. Messier 69 appears to be only 7.1 arc minutes in diameter in long exposure images. The cluster’s bright centre occupies an area of only about 3 arc minutes. M69 has a tidal radius of only 72 light years because of its proximity to the galactic centre. The cluster has very few known variable stars. Only eight variables have been detected, including two Mira-type stars, red pulsating variables, with periods of about 200 days. Messier 69 is one of the most metal-rich globulars known, which means that its stars have a comparatively high abundance of elements heavier than helium and hydrogen. The cluster has about 22 percent of the amount of iron that the Sun has, which is over ten times more than other globular clusters of a similar age. This is explained by the cluster’s proximity to the galactic centre and association with the Milky Way bulge, which ages and evolves significantly faster in terms of heavy elements. All globular clusters found in the galactic bulge are more metal rich than globulars located elsewhere in the galaxy. M69 has a spectral classification of G2 or G3. The cluster is believed to be about 13.06 billion years old, which means that the stars in it formed when the universe was only 700 million years old. Messier 69 and Messier 70 were discovered by Charles Messier on the night of August 31, 1780. Messier found M69 while looking for an object Nicolas Louis de Lacaille catalogued as Lac I.11 in 1751-52, noting that it “resembles a small nucleus of a comet,” and believed the two were the same object. However, Lacaille’s comet-like object had to be considerably brighter than M69 for the French astronomer to be able to see it through his 0.5-inch telescope, and the position of his object is 1.2 degrees away from M69.